A radical attempt to turn the Biggest Disappointment In Cinema History into a dramatic, coherent, emotionally engaging adventure movie. With the benefit of hindsight, The Phantom Menace is the most coherent, most Star Warsy prequel. I get the sense that Lucas made the film he wanted to make, without cowing to the perceived wishes of the fans (see: Yoda’s lightsaber fights in the sequels), or being straight-jacketed by the need to tie everything to the OT (see: everything in Revenge of the Sith). It also benefits enormously from being largely shot on actual locations, which gives TPM a verisimilitude sadly lacking in the other prequels. A further benefit is Liam Neeson, who gives the most rounded, humane prequel performance. Unfortunately there’s a lot of problems too: the film suffers a near total lack of tension, has horrible acting, dire scripting and a plethora of cartoon characters. By cutting much of the first 30 minutes, primarily by cutting the Gungan City sequence, and by adding shots of the Naboo populace being terrorised, some drama is added to the start of the film. By turning Jar Jar from a cartoon rabbit into a selfish, sarcastic comedy sidekick he becomes a bearable part of the film. By cutting as much unncecessary exposition and as much lousy of the acting as I could, hopefully the decent moments work a lot better now. I just had the pleasure of watching this fan edit of Episode I. Having watched many many fan edits (Besides the obvious Phantom edit, I've seen Seciors, ADigitalMan's, Hal9000, and Q2's. I even started to edit my own many years ago) I finally found what I think is hands-down the best Episode I edit there is. Period. It took a steaming pile of bantha poodoo, and turned it into a a real Star Wars movie. How you ask? Where to start?! First, by redubbing the audio and changing subtitles Yads has both turned the trade federation into an evil menacing threat and Jar Jar into an only-cares-for himself cool character. Infact, I even LIKED the guy, and a few times I even laughed out loud (instead of groaning in agony). Second, the edits. 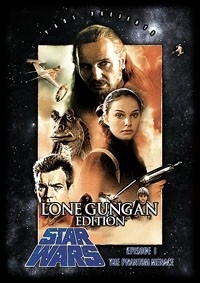 I always felt that the Gungans added nothing to the story or the plot, and th movie flows much better without them. I also really love all the cuts around Anakin, and how quickly the plot moved forward. Third, the order in which scenes are brought in the movie are brilliant. I never even thought to do some of the things that he does. The original TPM final battles took place simultaneously over 4 areas, and it was just too much! By eliminating one of them, and moving one of them forward it balanced out the action and pace of the movie. I could go on... but watch it. As for my rating -- I deducted some points for the quality of the audio and video. This is not really a fault of Yads, as ripping our audio and inserting new (and better) background music is impossible to achieve with out some sort of residual artifacts. But since the overall music and dubbing was much cooler, I only knocked off a couple of points. Narrative and Enjoyment 10/10. Dude. Seriously. You took a pile of horse crap and made it into a chunk of silver - not gold, but oh so much silver! I don't think this one will ever make gold because there are just some bad acting bits that can't be efficiently cut, but you took it almost as far as it could go... This edit is by far the best cut I've seen. If you want my opinion, there were some rough cuttings here and there, especially in the beginning war scene, but it all came through very well overall. Most importantly: You made a Star Wars movie. I have the 1:30:35 cut if that makes a difference to anyone reading this review that might have a different cut. 1. Jar Jar's voice was still kind of dumb (but not on the a-hole level of the original). If there was a voice less... 'bloopy' (if that's the word), and more like the Trade Federation voices, then he'd be vastly more bearable. 2. The pod race was a good edit, but still ran slightly too long. I think it would have done well to chop out the part between Ani catching up on lap 3 to Sebulba and when they tangled causing Sebulba to crash. The whole jumping up the ramp thing is still stupid, but minor complaint. 3. When running to the ship before Maul catches them, I would cut the "I'm tired" part of Ani's sentence "Quaigon Sir, wait I'm tired" and just have him say "wait" but again, minor. 4. The Terminator scene was jarring and strange. It should stay in the hallway scene with the Federation guy talking about the Naboo enslavement. Thankfully it's brief. 5. There was a really rough cut when everyone landed back at Naboo to take back the planet. Just after the part where Ani yelled "They're here" you could have just did a smash cut to them discussing the plans rather than chopping in that tiny bit of footage between and doing the diagonal rolling fade from Ani to the discussion of plans. 6. After Padme and her crew rappel up the wall, and land on the windlow ledge, it would flow better if you cut the scene of her slowly aiming at the window and just edited in the breaking the glass and having them bust through into the hallway. 7. I think the slo-mo on Palpatine was great at the end, but rather than doing that loop fade to the credits. I think just a normal fade or a smash cut would have worked better. All that aside, you worked wonders for this film... bravo. Notable fan fixes usually get quite good reviews on here, but I've not found most prequel fan edits to really be good enough. Streamlining, trimming, minor changes or only cuts, that is what they mostly consist of. So I was expecting it again here. But the number of changes here just exceed any version of the phantom menace I have seen yet. The visual editing was without any noticable errors, but the musical editing was phenomenal. It was great to hear those old musical cues again. They single handedly saved a bunch of scenes for me. This is really the first time I was surprised at the amount of changes, and the quality of the production, in a fan edit. Now, the reason I didn't give the narrative or enjoyment a higher score has nothing to do with the effort of the editor, but the abysmal state of the original movie. And having seen the movie already a few times didn't help either, and certainly stops me from being emotionally invested barring some really big changes to the flow of the story, and the story itself. One of the biggest flaws structure wise in phantom for me, is how little it is connected to the two other films. Lucas apparently wanted to do a kind of stand alone story, like a new hope. To blow up the evil thing at the end and then have some kind of happy ending. But simply trying to do something like before does not guarantee anything. The problem goes hand in hand with the all too present yet all too broken narrative of naboo. So much of the film is focused on trying to save naboo and yet we have no reason to care, and it has no connection to anything else in the film. The gungans are silly, and the naboo are dull. That is, in the original version. Obviously in this one only the naboo remain. But because of the way the original movie was set up, there is no real tension or drama between two opposing forces. The neimodians stay on their ships and take over the planet with their silly droids, then comes tatooine, and then the naboo go back to the planet and remove them. That's really all there is. With a new hope there was a real feeling of desperation concerning the rebellion. Inspired by real life revolutionary and rebellious movements, we get that sense that the rebellion is the underdog. But not here. Sad to say, I didn't feel like this edit improved that narrative "oomph" enough for me, because of the weak source material. I suppose I'm just demanding of movie narratives. It's still the best edit of the movie I have seen yet however. It basically takes out all of the really insulting factors. The biggest help in this is the fact that with new subtitles, the neimodians are less scared and weak, and more in control and far more evil. Instead of telling a silly droid to process the queen, he orders them imprisoned. And in his little chat with the "invasion guy" he orders his top people shot. That's the kind of grittyness the original trilogy had, and the new ones missed. If I were ever to make a fan edit, I would surely ask to use this version as a basis for mine. 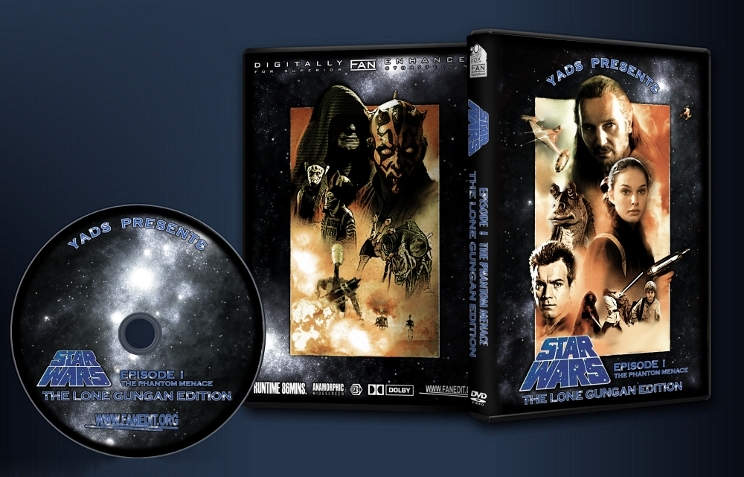 Personally I think that with some improvements, this movie could be on the level of what we expect for TPM: Revisited. -A new opening crawl would be nice. -Jar jar is the gaurdian of the forest? Not a problem for the story, but odd. Personally I'd just have him tag along with qui-gon because of the life debt and leave it at that. -The Terminator Salvation shot was quite obvious. -Not removing sidious downplays the neimodians and loses the mystery surrounding him and palpatine. seperatists. The Federation was evil, yes. But I feel that that change is only bolstering a weak part of the movie (these stand-alone villains) Personally I would say that it is more imperative to tie this movie to the sequals. -Perhaps one could even latch onto a crazy idea of mine, and have the Federation as the good guys and the jedi council and republic as the villains! Not entirely, but a certain moral grey story. Check it: Qui-Gon Gin makes bad decisions all the time, right? And what is he responsible for? The training of vader. Of course he couldn't see that specifically, but he was arrogant about it. The sith? EXTINCT for a millenia. Not in apparant hiding or weakened. Extinct. In a world like that were the only force users are jedi, what would balancing the force mean? But no, Qui-Gon and even the council are oblivious to that. That arrogance could be played up to give us a morally grey story. It could be about Count Dooku and the seperatists being outmatched by the influence and power of the galaxy's regime. Like the rebellion that follows, only this time they lose. It would add to the death of Dooku in part 3. The Federation could be attacking Naboo (replaced here with Alderaan) as a political statement, a desperate effort to fight the regime of the republic. But I'm rambling right now, and this is more of an overal trilogy idea. Overall, great edit, great work! I really, REALLY liked how you handled Jar-Jar in this edit, nice job! All edits should aspire to this same treatment. I also liked the slightly different story arc, it was a pleasant surprise. I do feel that you could have removed more scenes from Tatooine (trim down the pod race, reduce Anikan’s lines a bit). Leaving in a few scenes from the opening act would also be good (how the heck did those Jedi get down to the planet?). I also missed some of the \oooh, ahhh!\ scenery and spacecraft shots which you cut. Oh, and I watched the Version 2 of this edit; which has corrected all the sound issues; and I thought video quality was absolutely fine.